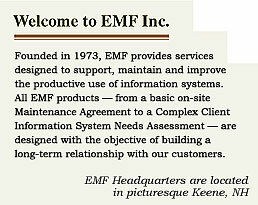 EMF is big enough to provide professional service, but small enough to offer you truly personalized service. We support products from more than 50 manufacturers and software publishers and also support Unix, Linux, Windows and NetWare servers as well as desktop PC environments. We're responsive, flexible and we never lose sight of the fact that our goal is your satisfaction. We offer two families of services: Professional Services and Support Services. Our Support Services are divided into Network "Soft" Services and Hardware Support. Our sales and customer service staff can provide you with quotations, literature and other information. EMF's Professional Services group offers a range of products that can determine your information system needs, design a solution, and provide integration, installation and project planning support. EMF's range of "Soft" Service products includes MIS Outsourcing, on-site and remote systems administration and remote monitoring support. Additional Support Services deal with Operating System failures, software support and Help Desk services. EMF also offers a full range of Disaster Recovery products in this category. An EMF Standard Response On-Site Maintenance Agreement ensures that you will have on-site support within one working day at your location in the event of a hardware failure. EMF offers a comprehensive range of Maintenance agreement options including Off-Hours support and Priority Response. Maintenance Agreements are customizable. 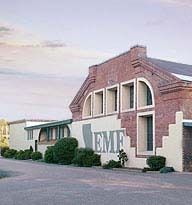 EMF's expertise encompasses every element of your system - including networks and operating systems. Our professional services team is experienced and knowledgeable. Our well-trained field service staff is backed up by a dedicated team of support personnel and an inventory of factory replacement parts and loaner units.